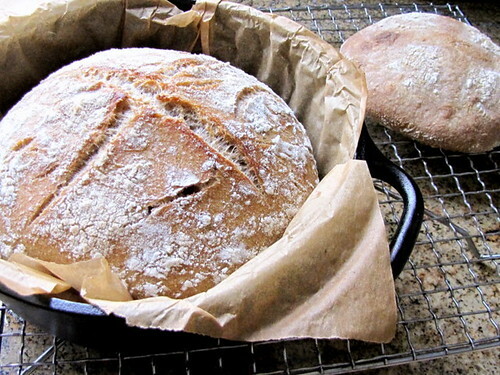 Mellow Bakers Vermont Sourdough ~ I Can Do That! It's June and we at MellowBakers have a new set of breads to bake: Beer Bread, Vermont Sourdough (three recipes to choose from), and Pizza. Initially this was the only recipe that I wanted to bake this month but decided I will also bake the Beer Bread in the coming weeks. The pizza, nah. I made the third version of Vermont sourdough with increased whole grain. I had a problem with my starter Brad. He seems to be sluggish these days since I ditched Angelina 6 months ago for a rye starter, Ryan. Brad started deteriorating although I was still able to make an excellent miche out of him. This time my levain build failed. I refreshed him for 2 days, 4 feedings every 12 hours and he seems to become alive although not as pretty, bubbly, and stretchy as he used to be. I think I have to make a new starter. Now the bread. This is the first time I baked this recipe. As usual I halved it. I used Ryan for the levain build, whole organic rye flour, and French gray sea salt which might have contributed to its yumminess. Wow! I'm impressed. It is chewy, tasty, sweetish, mildly acidic which is how I like it, and has nice big holes. I love it. 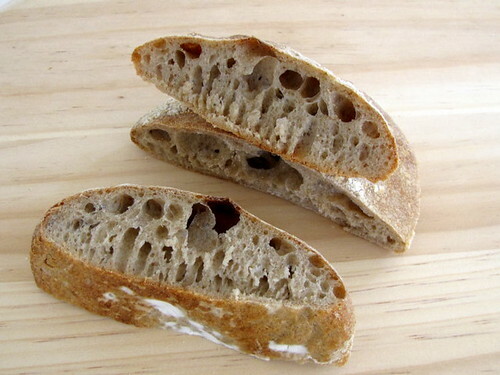 I have found my favorite sourdough bread and sourdough is not even a favorite. Well, now it is. The dough is somewhat slack so I decided to bake it in my cast iron pot which is very small and can only accommodate 1½ pounds of dough. There is an excess of about 7 ounces of dough which I baked directly on a 6-inch quarry tile. The one in the pot baked plump and tall. While it's cooling I sliced the small loaf which is not as tall but has a beautiful crumb with large holes. I polished it off while uploading the photos and writing this post. Have I already mentioned that this bread is delicious and that I love it? For those who want to try baking this wonderful bread here is Wild Yeast's recipe based on Jeffrey Hamelman's. It is great you made it already. Yours look great. Yum! I've never been a big sourdough fan, but this looks and sounds delicious! I will have to make it soon! I will have to make another go-round at this one; yours looks phenomenal! 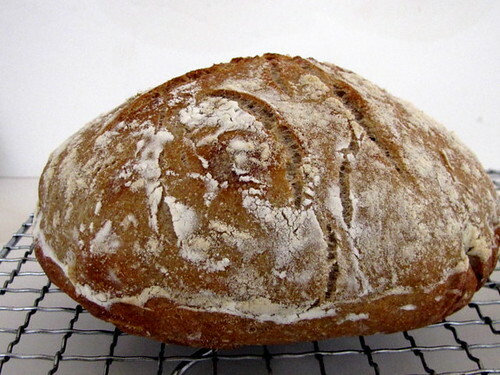 I've never tried making sourdough bread, but I applaud home bakers who do - and your loaf looks great! Wow! That looks delicious! The holes are beautiful! Good idea to bake it in your cast iron pot.